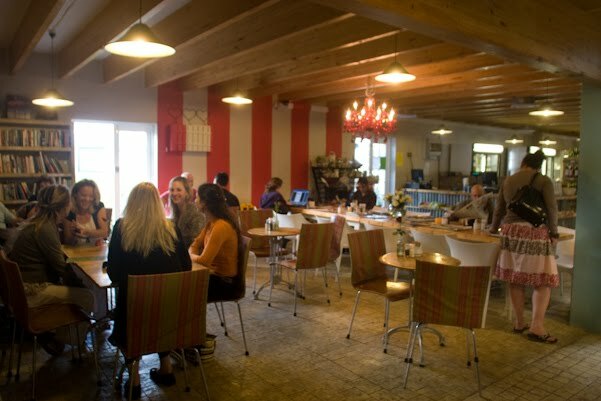 The Foodbarn Deli started in a corner of the Foodbarn Restaurant in Noordhoek Farm Village. 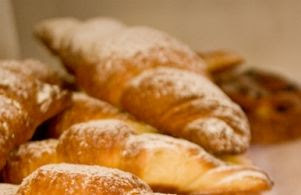 We all loved the cakes and the croissants, the pastries and the pies that emerged hot and steaming from the kitchen. There were all sorts of other wonderful treats to buy and buy we did. 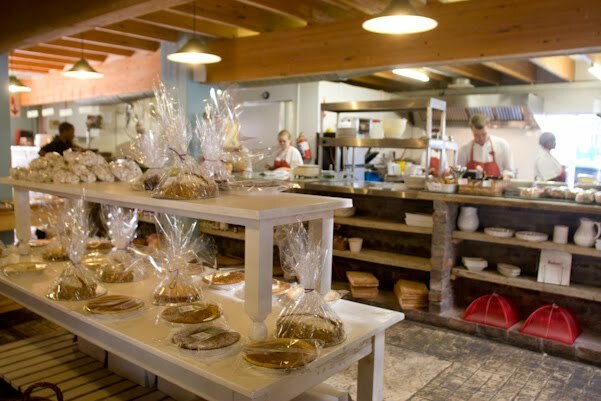 It became part of the Foodbarn experience to wander over to the deli during the course of a meal and scrutinise the day's offerings. The waiters knew where to find us when our food arrived at our tables. In 2008, the deli moved across the village green into new premises with shiny bright kitchens and shelves groaning with produce. Franck and Pete, as ever, pooled their talents in the creation of this incarnation of the deli and bakery. The food remains Franck's domain. Everything that is cooked or baked originates from him and is subject to the maestro's purist's eye and unshakable standards of perfection. Pete, a passionate ideas man, handles all things commercial, from the administration to the marketing and the accounting. Not least of all are his formidable people skills. He is a genial and welcoming host who enjoys the company of his guests, many of whom are now like old friends. The burgeoning demand for the deli's delectable edibles and comestibles has meant once again extending the kitchens and acquiring extra space to satisfy the growing legions of dedicated followers. The Foodbarn took over a wine shop and an artist's studio and there is now a lovely space to sit and enjoy a much bigger menu and to savour the delights of a 7 day wine licence. I fervently believe that breakfast at the Foodbarn Bakery & Deli is the best there is. The Eggs Benedict, smothered in the most superb Hollandaise sauce that I have ever eaten, are unparalleled. Enjoyed with a choice of bacon on a delicious potato rosti, or succulent smoked salmon on a sweet corn fritter or roast mushrooms and spinach on a rosti, they are perfection. What else would you expect with the legendary Franck Dangereux at the helm? You can have a 'Simple Breakfast' or indulge yourself with the wonderfully named 'Whole Goose' The 'Simple Breakfast' includes a poached or scrambled egg, bacon, tomato, roast mushrooms with toast and preserves. The 'Whole Goose' is a more fulsome affair and served with sautéed potatoes. Naturally the egg mixture is prepared the French way; not diluted with milk or water or anything else and the finished product arrives light, moist and melt in the mouth. 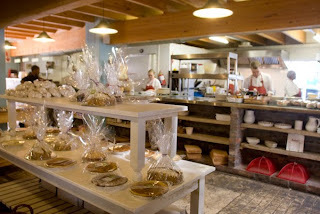 Winner of the 2010 Eat In Award for Fresh Produce: Best Bakery', their products include the 100% rye bread and pork and red wine pie. No quick and easy methods of bread- baking at this bakery! Oh no! An artisanal approach from start to finish. Stone ground flour, no additives, preservatives or chemicals and dough that is left to prove for as long as possible. 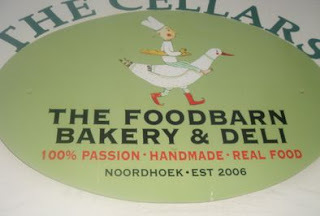 The bread, pastries and cakes at the Foodbarn are legion. You can choose from an array of cakes that include Chocolate, Orange Drizzle (Eugene's favourite), Chocolate Almond Torte, Apple Crumble and so much more. The amazing pastries include my absolute favourite and impossible to resist Chocolate Brownies. Enrobed in ganache and packed with nuts, these can make you sing with joy. Surveying the display of beautiful offerings is a feast for the eye as well as the stomach. Crunchy Florentines, beautiful Pear and Almond tarts, melt in the mouth Pig's Ears and lovely chewy Date Balls are just a few of the delights that make choosing almost impossible. There is a wonderful mix of people who arrive at the deli. Mother's fresh from the school run meet for coffee and wonderful treats at the deli. Riders arrive for a late breakfast, cyclists, like my daughter Lexie and her buddies, make this a stop of choice for coffee and famous croissants which can be enjoyed all day. And of course, the very many who drop by for their daily supply of Foodbarn Bakery bread. The ambience is happy and bustling. 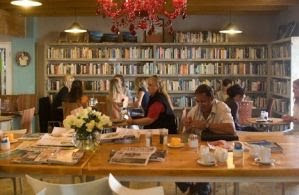 The Barn Bookshop is a meeting place for local bibliophiles. There is a wall of books for browsing or buying which provides a wonderful corner for those who love books or write books or who are sitting on their own and enjoy the company of books. 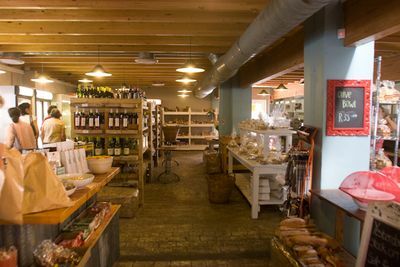 Lunch at the deli includes a delicious selection of salads, sandwiches and trammezzinis. It is always a warm and cozy scene with people enjoying lovely fresh produce which is all sourced locally and with great care for the environment. Pete and Franck are ardent believers in the moral imperative of limiting their carbon footprint and in the use of organic meat and fresh produce. Their meat is "happy meat" from animals that are allowed to roam free and enjoy a healthy diet. Their fish is strictly on the green list of the Sea Fisheries Institute and they do not budge from their resolve. One never finds out of season delicacies such as crayfish and perlemoen on their menu. 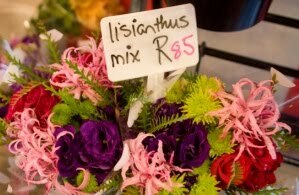 Fresh flowers are available everyday. 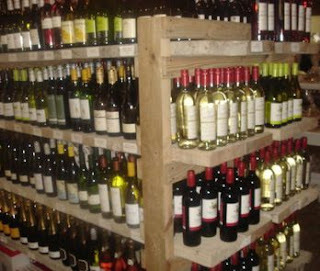 All the lovely wines that are served in the Restaurant are sold in the deli and the shelves glow with rows of the ruby-coloured, rosé and white wines. We always wander around the shelves as if we are in an art gallery. We peer at everything and choose lovely things to take home to cook or we buy something that is ready to eat that evening. The pies are luscious and packed with steak and kidney, chicken, beef, vegetables or a combination. Homemade meat or vegetable lasagne and moussaka are just some of the meals waiting to be taken home to eat. We love the potato salad and the couscous salad and I was so delighted to find tubs of homemade chicken and vegetable stock. What a find!! There are endless homemade pâtés and dips and all manner of wonderful concoctions. Naturally there are organic vanilla pods, special bottles of Foodbarn olive oil, balsamic vinegar and jar upon jar of wonderful jams and confections. There is so much more waiting for simply anyone who is looking for a special eating experience and an exciting eating adventure. with the exception of the header and the shelves of wine bottles. Eugene and I love eating out and we especially love anything to do with the Foodbarn. We always pay for our meals and for anything else that we acquire whenever and wherever we go.